Olmsted Park—From Malarial Swamp to Popular Green Space. In 1880 the growing pollution in the brackish water of a winding tidal creek forming a natural boundary between Brookline and Boston, concerned the townspeople that lived in this area . 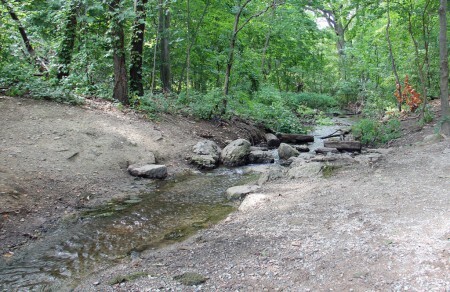 In Brookline, a three man Park Board was elected to work with the Boston Park Commission and Fredrick Olmsted to develop a plan for improving conditions in this small stream called the Muddy River. 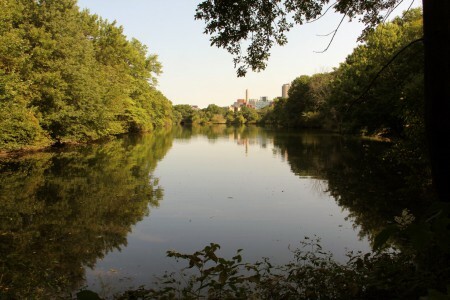 Olmsted developed a plan for “The Sanitary Improvement of the Muddy River. The Brookline Commission led by Charles Sprague Sargent (first director of the Arnold Arboretum) worked for fifteen years to make Olmsted’s plan a reality. Olmsted’s plan called for changing the meandering line of the river to more regular course. 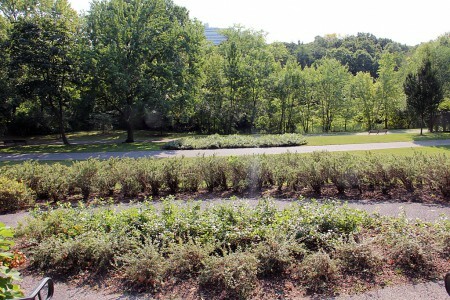 Both banks of the river from Longwood avenue, on the Boston side of the Necklace, to Olmsted park, were planted with native trees and shrubs. Most of the Muddy river that flows through the park was reworked. The large malarial swamp at the northern end of the park was dredged, and a out flowing stream was dug from an ancient kettle pond at the southern end of the park, allowing water to flow to the dredged area to create Leverett Pond. The swamp was now transformed into a linear park with three major ponds connected by a natural looking but man-made watercourse. The park also features six granite pedestrian bridges, and several attractive walkways and natural stone walls. All of this is embedded in 17 acres of dense woods configured to shelter the park from the busy city that surrounds it. Unfortunately,over the years this chain of waterways has become clogged with silt and invasive vegetation grew up along it’s banks and in shallow water. These conditions have caused flooding along the river from Olmsted Park in Brookline to it’s outlet into the Charles River in Boston. The Muddy River is currently undergoing a restoration project to improve flood control and water quality. 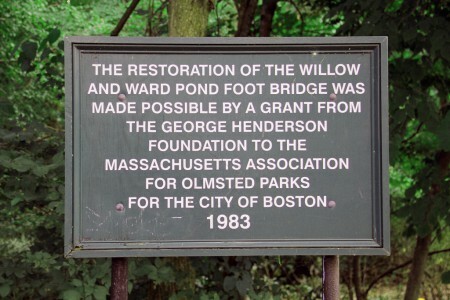 This was started in the 1980s when the State appropriated about one million dollars for the restoration of Olmsted, the Muddy River, and other parks in the Necklace. With the support of then- Governor Michael Dukakis the Emerald Necklace Plan was completed in 1989. This plan, which is still in progress, represents a road-map for the long-term restoration of this majestic park system. 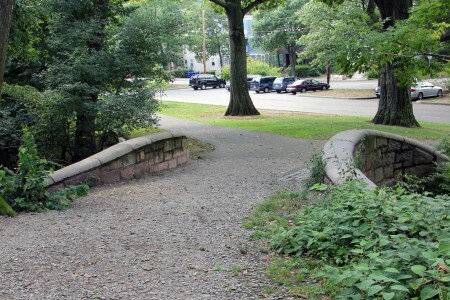 Of special interest to those that frequent Olmsted Park was the restoration of the Babbling Brook section of the Muddy River, which flows inside the park from Willow Pond to Leverett Pond. Other improvements to the park include: the transformation of a parkway originally designed by Olmsted as carriage road into a bicycle and pedestrian path, and the recreation of Allerton Overlook. 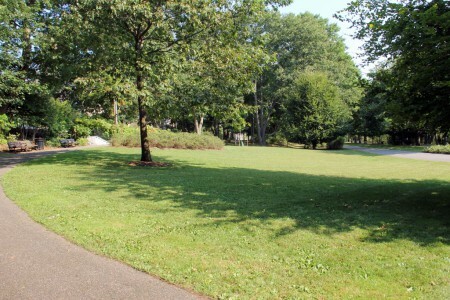 This semi-circle walk descends into the park onto the bicycle and pedestrian walk and provides a scenic view of the banks and islands of Leverett Pond. 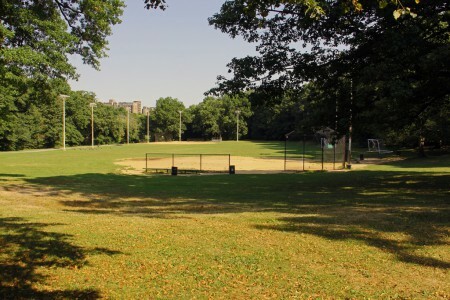 Two influential and productive Town of Brookline park advocacy groups, the High Street Hill Association, and the Friends of Leverett Pond have been very active participants in the implementation of Master plan in Olmsted Park. 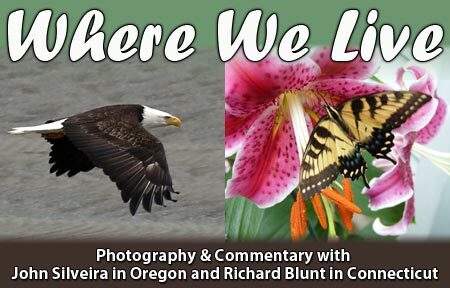 For the past two decades these groups have held neighborhood celebrations, park clean-ups, and pruning workshops. They have also worked to increase awareness of issues of park stewardship. Olmsted’s designed this park to create a countryside setting in middle of an urban setting. In this park and others like it, he designed broad spaces of growing grass, broken groves of trees. Throughout the park a visitor experiences the reflection of foliage on bodies of water to produce an element of in intricacy. This effect was similar to parks on estates that Olmsted had visited in England. He called this style of park design, pastoral. My second tour was during Boston’s busy evening rush hour. Walking through this park, even during this hectic time of day, is an exercise in peaceful relaxation. The noise and confusion of city is left at the entrance. On my first tour, I was preoccupied with looking for some sort of majestic grandure. As a result, I failed to recognize the familiar pastoral eloquence that made growing up in this area such a wonderful experience . I entered the park at the north entrance near Brookline Village, and walked along the pedestrian path to Allerton Overlook. Behind this vista of trees is Leverett Pond. For most of the year this overlook offers a spectacular view of the pond and it’s islands. 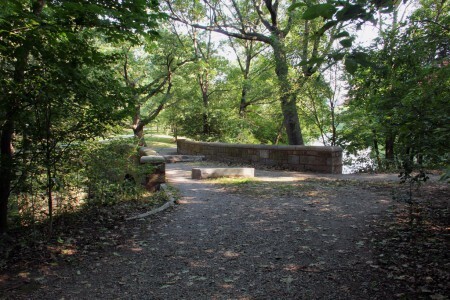 This granite foot bridge gives access to the park, over the river outlet from Willow Pond to Leverett Pond. 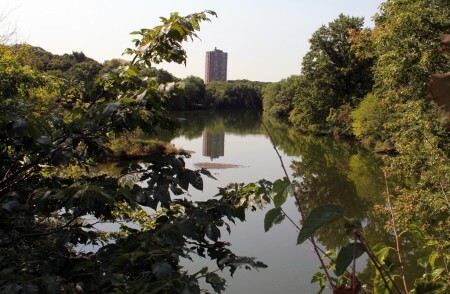 Two Views of Leverett Pond facing north toward Brookline Village. Originally, Olmsted designed this area as large meadow surrounded by woods. It has since been redesigned into playing fields to serve community groups for little league, soft ball, soccer and touch football. The babble has been restored to this section of the river. 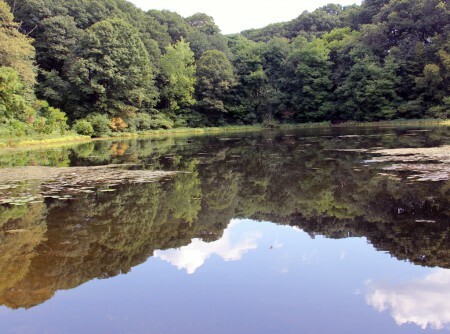 Wards pond is an glacial “kettle hole” formed at the end of the last ice age. In this scenic , heavily wooded area I found a quite wilderness just yards form the busy rush hour traffic surrounding it. There several gravel walking paths in the park that invite the visitor to safely walk through heavily forested areas. The path that I took led me to this recently restored foot bride and back to the paved pedestrian path. The park is open an well maintained during the winter months. The cold weather and the snow add very different but unique beauty to this place. I visit the Boston/Brookline area several times during the holidays. During these visits, I will return to this and other parks in Necklace and share the experience with you. 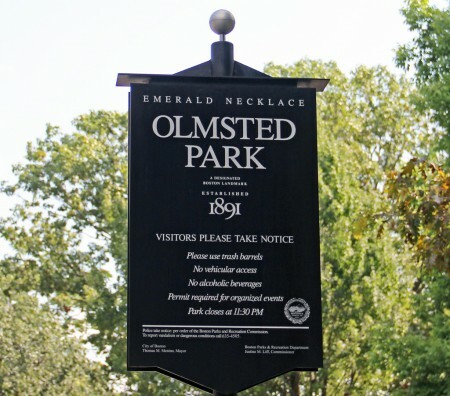 Posted in Olmsted Parks | Comments Off on Olmsted Park—From Malarial Swamp to Popular Green Space.